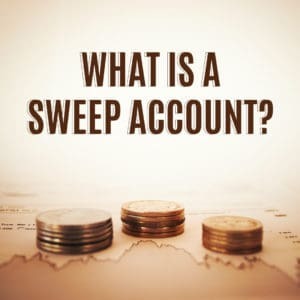 Home » What is a Sweep Account and How Do I Use It? Every brokerage account has what is called a “sweep” feature or sweep account. It can be both a benefit or a detriment depending on how you use it and what options you selected when you set it up. When you setup a new brokerage account, you usually have to assign what you do with your cash. This is called the sweep. As you deposit cash into an account, it will, by default, go into the sweep. Also, if you elect to have dividends paid in cash, they will sweep into the account. The great thing about the sweep account is that when you want to buy more securities, the cash is automatically swept back into your brokerage to buy the securities. If you trade on margin, the cash in your sweep account will also be counted towards your margin requirement. There are several benefits of setting up a sweep account correctly. First, most sweep accounts are FDIC insured, which provides your cash with a level of protection. Second, you can earn interest on the money in the sweep. If the money just sat in your brokerage, chances are you would earn nothing. To earn some interest with the cash outside of a sweep account, you would have to invest in a money market fund. It is important to note that sweep accounts are one of the most profitable products that investment firms offer. You may wonder why? Because most individuals don’t set them up correctly, and as a result, the firm pays you nothing on you cash. When setting up your sweep account, look at the options available to you. Money market, savings accounts, etc. Don’t just settle for a yield of 0.01%. Some institutions are very flexible with what you use as your sweep account. There are some that even let you link your sweep account to your regular checking account. This can be very convenient if you draw on the cash in your brokerage regularly. On the same front, if you have a high-yield savings account, this could be a great sweep account. It is important to note that the sweep feature is only available on standard brokerage accounts. If you have a retirement account, you need to look at how your cash is being handled in the account. Readers, are you maximizing your sweep account, or is your cash just sitting there? Thanks for this article. I didn’t know there was a name for that account. 🙂 Now I know. Hm, I wonder if this is available on my account at Zecco…. It should be – what are they doing with any cash in your account? Maybe nothing? Like Ashely, I didn’t know there was a name for this. Thanks for sharing. I think this is how my investment brokerage is set up with TD Waterhouse. I’ve set my high yield account as my sweep. I get a great interest rate on cash and dividend money that’s not reinvested. As you say, pay attention to how you set up your sweep accounts. If I had chosen the default account provided by my broker, I would’ve got next to nothing as interest. Nice job MoneyCone! That’s how you maximize it! 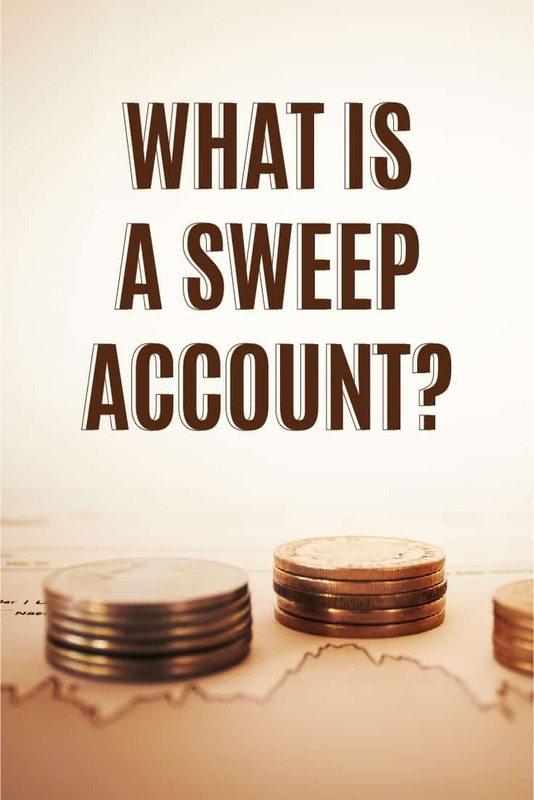 You don’t have a lot of options with a sweep account – the goal is to not keep any money there. Instead, you want to keep it invested. Just choose the option that gives you the best return, and realize that you want to invest any money that’s sitting in your sweep. A sweep account isn’t an investment, but just like a savings account at the brokerage. I’m in the same boat as Phil – setting up my E-trade account for the first time to take advantage of my company’s ESPP. I’m also confused about what the second option – “Credit interest” – means. Can you shed some light on that? Thanks! Is an FDIC Insured Cash Balance sweep account with 0.30% APY a good way to go? It’s probably going to be one of the best you’re going to find out there right now, so I would say yes. What if it’s compared to a state-specific tax-exempt money market fund, which is not subject to either federal or state tax, with 0.01% 7-day yield; is the 0.30% APY Cash Balance account better or vice versa? Thanks Robert! I have an ira at TD AMeritrade. The mutual fund I have in there isn’t doing great so I want to sell the shares and then immediately buy a different mutual fund. I understand when I sell the shares, the money goes into my sweep account. But my question is, is the sweep account still considered part of my IRA? I just want to go with a different mutual fund and don’t want a taxable event. Yes, the sweep account is still part of your IRA – it’s inside of it. When you sell, the money goes into the sweep account. When you buy your new mutual fund, the money is taken out of the sweep account. Thanks Robert! Glad I found your site, bookmarked! From the information I have read on this site, it appears that the ‘sweep account’ that is currently part of my IRA should NOT have thousands of dollars in cash just sitting there. The IRA is managed by my advisor. How would I phrase my question as to why that money is just sitting there? I don’t wish to sound aggressive but I would like to know what’s happening with that cash; If I understand what I read from your page, there’s a good ‘chunk of change’ sitting there. Is it ‘liquid’ (i.e. can it be withdrawn with no taxes/penalties)?? It’s just cash sitting there. Ask your advisor why it’s not invested? Is cash part of the allocation you created when you setup this plan? It’s liquid, in that it’s cash. Can it be withdrawn – no. The IRA rules still apply. i m new to all an any of this, so id like to know if there is an option that allows you to automatically reinvest my profits on a stock into said stock if it does excell? I’m a bit confused by your question. You only get profits when you sell a stock. If you wanted to re-invest in the same stock, why would you sell? So my boyfriend’s former employer rolled his retirement accounts to a cashsweep account after they went out of business, and we just found out that his money has just been sitting doing nothing for a year. It has “Rollover Traditional IRA” listed as the account type so would these dollars still be pre-tax in this account? I’m wondering if he can roll it into a traditional IRA or a ROTH IRA? He doesn’t know what kind of account it was while he was still employed there. It’s in a traditional IRA if that’s what it’s listed as – that means it’s still pre-tax. He just never went in and invested the money, so it’s just sitting there. You don’t need to change accounts – you just need to make an investment choice. Does the FDIC coverage limit apply in a sweep account, ie: $250,000. Per account holder? Yes, most sweep account positions are FDIC insurance. You need to confirm with your institution and sweep selection, but in general they are.